Source: Stegmann, B, (1934), Ueber die Formen der grossen Möwen (subgenus Larus) und ihre gegenseitigen Beziehungen, Journ. f. Ornith. 82: 340-380. Stegmann's work on gulls was very thorough and like Dwight's was based on a systematic study of skins. 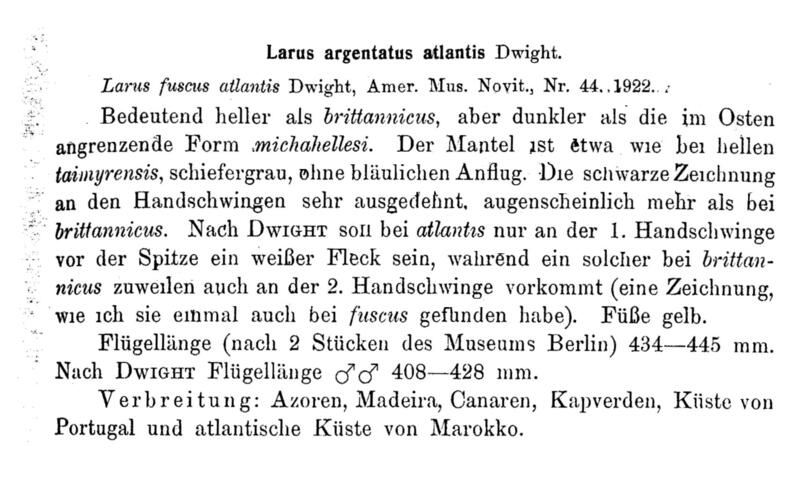 The entry for atlantis appears to owe quite a lot to Dwight except for the classification as a race of argentatus (Larus argentatus atlantis); michahellis is classified at the same level (Larus argentatus michahellesi). Azores, Madeira, Canaries, Cape Verde, coast of Portugal and Atlantic coast of Morocco. So the range is that of Dwight plus Portugal and is almost identical to that of Southern Atlantic Yellow-legged Gull (Southern atlantis) in the present study. extensive reference is made to Stegmann for a number of proposed species but no mention is made of Stegmann's work in the section on michahellis and atlantis. So Dubois and Yésou ignore (Stegmann) or misquote ( Dwight ) both of the seminal articles on atlantis from the first systematic studies of gulls.